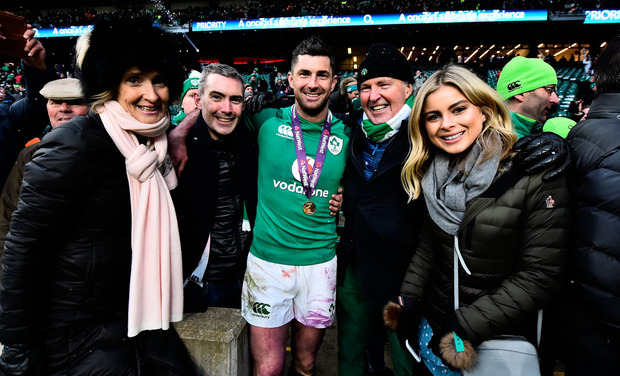 Sinead Kissane on Rob Kearney: Why is the most decorated Irish player of all time not out on his own as the most admired? On the evening of November 26, 2013, Rob Kearney put on his coat and runners, left his home and walked aimlessly around Dublin for an hour. He couldn't shake off what happened two days previously and he walked not knowing where he was going or what he was doing. It was something he'd never experienced before but it was because Ireland had gone close to doing something they had never done before. Forty-eight hours earlier, in the first half of Ireland's game with New Zealand at the Aviva Stadium, Israel Dagg knocked on with Dave Kearney charging towards him. The ball popped into the arms of the elder Kearney who took off and sprinted down the pitch to score a try. Ireland led 19-0 after 19 minutes. And then - well - you know how the story ends. "I've always been able to control my thoughts and emotions after a game but that was one that hit me unbelievably hard," Kearney recalled in No Borders: Playing Rugby for Ireland. Three years later, a tweet from the official All Blacks account asked which full-back - Ben Smith or Kearney - would have the edge in their game with Ireland the following day in Chicago. One punter replied: 'Ben Smith, then daylight, and then Rob Kearney'. The next day Ireland recorded their first win over the All Blacks and like every other player, Kearney worked within a system which produced a masterclass, while his jinky footwork also set up CJ Stander's try. 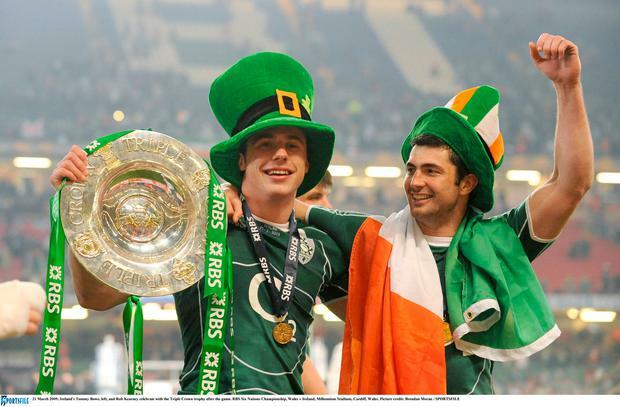 How's this for daylight: Kearney is the most decorated player in the history of Irish rugby. A quick recap: he's the only player who started all 10 games in Ireland's two Grand Slams, he has four Six Nations medals and started every game in the championship-winning seasons of 2009, 2014, 2015 and 2018. He toured with the Lions in 2009 and played in all three Tests. He was also selected in 2013 but a hamstring injury limited his game time. Since making his international debut in 2007, Kearney has played 83 times for Ireland and he recently signed a new IRFU contract which will take him up to November 2019. Kearney's immediate future is all about next weekend in Bilbao, where he could bank his third Heineken Cup/Champions Cup medal if Leinster beat Racing 92. He missed the victorious Heineken Cup final in 2011 because of injury (he played only two European games that season) but won European medals in 2009 and 2012 and a Challenge Cup in 2013. He has three Celtic League/PRO12 medals and was the last Irish player to win the European Player of the Year - in 2012. Yet, why is the most decorated Irish player of all time not out on his own as the most admired? Kearney has taken a lot of flak during his career. He's been criticised for not counter-attacking enough. For not off-loading enough. For going into contact too much. For not being Simon Zebo, Jared Payne, Joey Carbery or Jordan Larmour. For not mopping up mistakes made by players further up the defensive line. For being solid, not spectacular, safe, not surreal. There was even criticism when he was awarded man of the match for the Six Nations game against Scotland in March. It's easy to appreciate the obvious traits which make us admire a player. Brian O'Driscoll did things we never saw an Irish player do before. Paul O'Connell talked and played with a kind of passion we're unlikely to see again. And there's Johnny Sexton. If every work-place had a Sexton to drive and motivate their employees then Silicon Valley would look lazy and inhibited by comparison. There can be less of a premium placed on characteristics like stability and reliability even though the pressure of big games can easily distort a player's ability to show those traits. Sometimes stability and reliability can be taken for granted, they can be overwritten as boring, but that's a lazy disservice to players - like Kearney - who possess those valuable but sometimes under-rated traits. What makes Kearney an obvious hit with coaches is not what he might or could do but what he will do. "I can rely on him. As a player playing with Rob, I would never fear for him," former Leinster and Ireland full-back and current Leinster backs coach Girvan Dempsey said this week. "And it's the same as a coach. I know that he will do his prep, that he will do his video work, he will do his analysis, he will make sure that his body is ready, he'll make sure that he knows the game-plan inside out and I know that he's going to deliver". It's the nature of the position that full-backs can get a raw deal because its not what the 15 does but what they don't do which can get pounced on. "If the defensive system is breached, you're expected to lock it up. If you don't, then that's the one that's nit-picked. It's ultimately up to you, you are the last line of defence," Dempsey added. "Rob reads the game so well. He reads the triggers of the opposition. They're the things you learn through experience." Dempsey clearly remembers Kearney's first game for Leinster in 2005 against the Ospreys at Liberty Stadium when Kearney's clearance kick was charged-down, resulting in an Ospreys try. But what stayed with Dempsey was the way Kearney kept his head and responded by scoring a try. "I just remember that day how composed he was. I think any other player on an occasion like that on your first cap, it would have impacted them, some guys would have crumbled, some guys would have gone into themselves but he certainly showed mental fortitude," Dempsey said. It was a sign of things to come for Kearney as he's continually come back from setbacks throughout his career whether it's been because of injury with his back and hamstring problems or loss of form and resulting calls for him to be dropped. In Chicago, he answered the doubters and Joe Schmidt's request to him that he needed a big game. He dealt with calls for Larmour to start at full-back in this year's Six Nations and the idea that he was on borrowed time by having one of his best championships in years. It's not just the O'Connells and Sextons who are known to flex the rhetoric. In the week leading up to Ireland's Grand Slam game with England in March, Kearney warned about players not going into their shells like he felt he did in '09. It's a message that carried all the way into the game. Of course, the most famous Kearney words were the ones delivered in a meeting room in a hotel in Enfield in December 2008 when he questioned if Munster's players could play with the same spirit in the green of Ireland that they showed with their province. Those words weren't so boring now were they? Kearney has been a common denominator in Irish rugby's success story over the past decade. There will be other full-backs with more flair and X-factor but Kearney has proven himself to be a player for the big occasion. As well as his reliability and resilience, that's a trait worth the admiration alone.